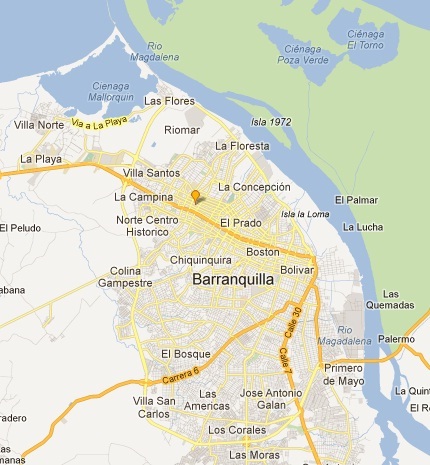 Barranquilla – Where North is West-ish | Barranquilla or Bust! Ever since Gio and I began contemplating a move to Barranquilla, we were told to live in “El Norte”, the northern part of the city. Our neighborhood, Torcoroma — named after a Romanesque style church in the area that I have yet to see — is definitely considered to be smack in the middle of El Norte. When we take a cab toward El Centro, the center of town (I know, I know, you never would have guessed that “El Centro” means “center”! ), everyone says we are headed South. The orange pinpoint is Torcoroma, our neighborhood. “El Centro” is the area sort of between “Boston” and “Bolivar” on this map. So imagine my confusion when one afternoon, on just such a drive, I realized that the sun was in the wrong place. Instead of being on my right, it was almost behind me. The cab driver, Ricardo, laughed and explained that in Colombia, North is less of a direction than a socioeconomic designation. He clarified that we were actually headed more East than South at that particular moment. He joked that in Medellin, North is actually South. (I’ll leave it up to those of you familiar with Medellin to verify whether this is true.) 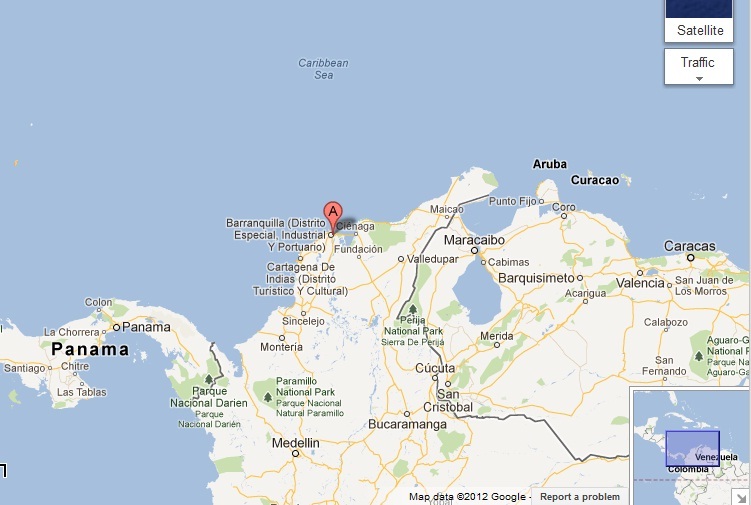 It’s not so stark in Barranquilla: El Norte is generally in the northern part of town. Part of the North/South weirdness seems due to the orientation of the main thoroughfares that connect various parts of the city. Nonetheless, the amazing flexibility exhibited by folks here seems to apply even to the cardinal points on the map. Honestly, why can’t North be West? Sure, no problem! A la orden. 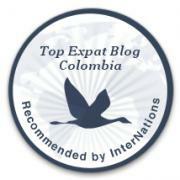 Barranquilla is on Colombia’s Caribbean Coast, toward the “top” of South America. Check out the little inset at the bottom right to get a sense of how close we are to Cuba and Florida. 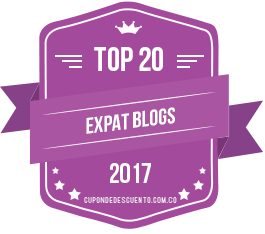 This entry was posted in Daily Life, Uncategorized and tagged adventure, barranquilla, Colombia, expat, international, Latin America, map, south america, travel. Bookmark the permalink. Aca en Puerto Rico nadie usa North South East West (except for me, I still try!). It’s all about “subiendo” o “bajando”. Bajar a Ponce, subir a San Juan. Dobla en la esquina donde hay un puesto de gasolina y un Walgreens (both of which can be found on just about ANY given corner) y pasas una, dos, tres, ah… sí en la cuarta luz a la derecha. Love reading your stories, I sure can relate!!! I’ve just about figured out the direction thing here…but it really makes me miss Bogota, where the mountains are always east to guide you, North means North and South means South! I hear you! That reminds me of when I moved from Seattle to Miami… I was so used to having the mountains as a point of reference. At least both Miami and B’quilla have a grid for the streets and all, though… that helps!